This quote, attributed to Socrates, appears in the opening sequence of director Tareq Singh’s sword-and-sandal, man-and-mortal elevated fantasy film, Immortals. The quote is a bit like the overall tone of the film: interesting, explicitly theological, somewhat true but not exactly scriptural. 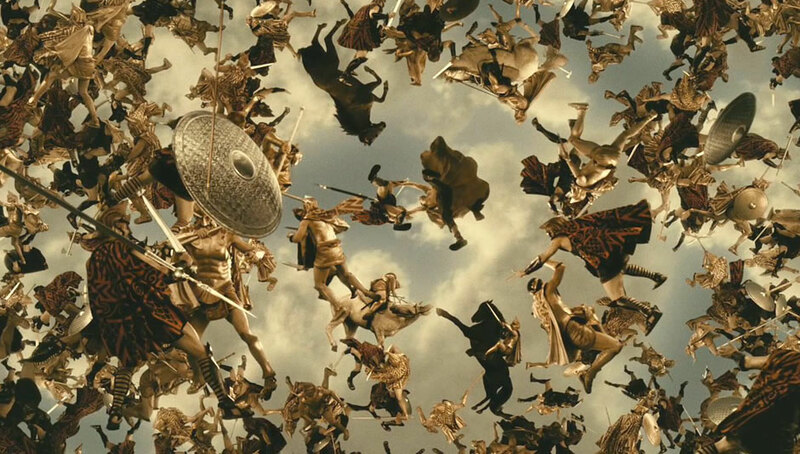 Marketed as being “from the same producers as 300,” it features incredible visuals, (including over-the-top violence similar to the aforementioned Spartan epic,) but a weak storyline. 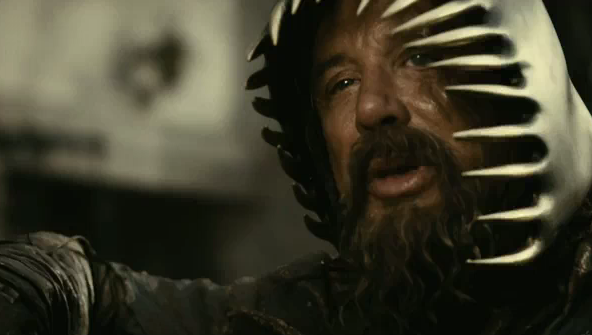 (I would rank it below 300, but above last year’s Clash of the Titans.) Despite a plot that is at times scattered and in-cohesive, and a setting that is more anachronistic than mythologicaly accurate, Immortals provides some excellent depictions of spiritual truths, and some very inspiring moments of demonstrated faithfulness. Overall I found this movie to be very thought-provoking, and I liked it. 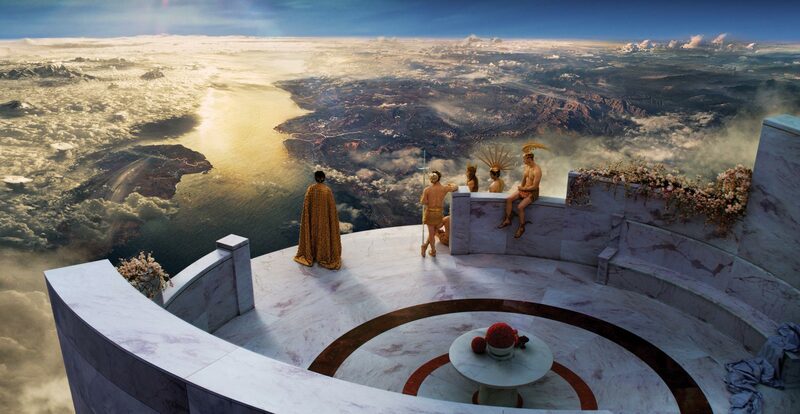 The gods of Olympus watch the affairs on earth with concern. Zeus in his mortal disguise (left, John Hurt) and his natural immortal appearance (right, Luke Evans). Zeus still wants to influence humanity, however, so he uses an indirect method. 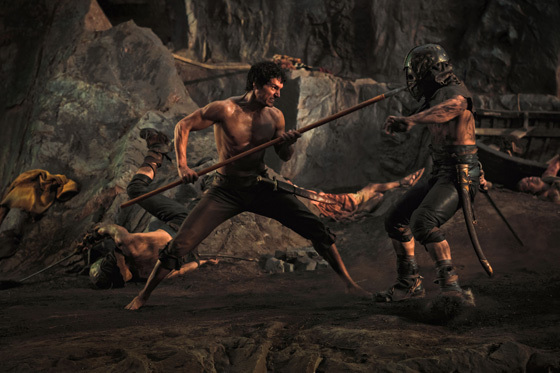 He disguises himself as an elderly man, and mentors the fatherless Theseus from childhood, teaching him to fight as well as urging him to consider “finding a good reason to draw your sword in the first place.” Zeus says, “If there is one human who can lead them against Hyperion, it would be Theseus. But it must be his choice.” I really liked the illustration of this subtle strategy, because I do think that God prepares people for the roles he has in mind for them. Think of Moses, who grew up in an Egyptian palace, then lived in the wilderness for 40 years, which made him the perfect man to advocate against the Pharaoh and then lead his people in a long-term desert lifestyle. Or think of why Zechariah and Elizabeth were chosen to be the parents of John the Baptist. “Both of them were upright in the sigh of God, observing all the Lord’s commandments and regulations blamelessly,” (Luke 1:6), making them suitable parents to raise the man who would “make ready a people prepared for the Lord,” (Luke 1:17). You could even compare Zeus’s choice of a mortal hero in Theseus to God’s choice of David as the next king of Israel, even though he didn’t appear as physically kingly as his older brothers, because “the LORD does not look at the things man looks at. Man looks at the outward appearance, but the LORD looks at the heart.” (1 Samuel 16:7). Athena brings a gift of horses. "They will run until their hearts give out." This is the confidence we have in approaching God: that if we ask anything according to his will, he hears us. And if we know that he hears us–whatever we ask–we know that we have what we asked of him.” –1 John 5:14-15. One of the important things to note in this passage is that it is a conditional statement–“if we ask according to his will” Not just “if we ask”. If we are honestly thinking about God’s will when we pray, we will have to be open to the idea that he might have a larger plan that doesn’t coincide with what we think we need or want right now. When Joseph was thrown into the pit by his brothers, do you suppose he was praying that he would get out and be able to return home? Do you suppose he felt that God hadn’t answered his prayer when he was instead sold into slavery? Yet it was Joseph who later realized, “You intended to harm me, but God intended it for good to accomplish what is now being done, the saving of many lives.” (Genesis 50:20). There is a similarly cool moment in Immortals that illustrates how prayers might be answered in ways you weren’t even thinking about at the time, that end up being better than you could have known to ask for. I understand there are many Hellenics who put faith in gods and legends, but we in the Hellenic Council do not. They are metaphors, myths! We are a society of laws based on negotiation and reason. Really, the spectrum of characters in their belief or disbelief in this movie mirror those in our society today. There are some who believe devoutly, (like Theseus’ mother and the Virgin Oracle Phaedra), some who are ambivalent (like Theseus is initially), some who claim a lack of evidence that the gods exist (like the thief), some who angrily and bitterly reject God, blaming him for their painful experiences (like Hyperion), and some who claim science and logic as their god, (like the council members). Hyperion is pretty purely evil. He reminds me of 1 Peter 5:8, "Your enemy the devil prowls around like a roaring lion looking for someone to devour," partly because he was literally devouring food in several scenes. There are some incredible moments of ultimate devotion and loyalty in this movie. They are another one of the reasons why it is rated R, since they involve people being tortured and maimed. In one instance, Hyperion taunts a monk, saying he knows it is against the monk’s vows to kill either himself or another person, so he might as well give up his weapon and tell them the location of the Virgin Oracle already. The monk’s response is to cut off his own tongue, in order not to break any of his vows, (including his vow to protect the Oracle). It’s an incredible act, reminiscent of the passage where Jesus talks about cutting off body parts that cause you to sin, (Mark 9:43-47), and while I think it’s pretty obvious that Jesus was using hyperbole, it’s still an incredibly powerful visual. Being that dedicated to a cause, that determined to avoid behaviors offensive to your beliefs. 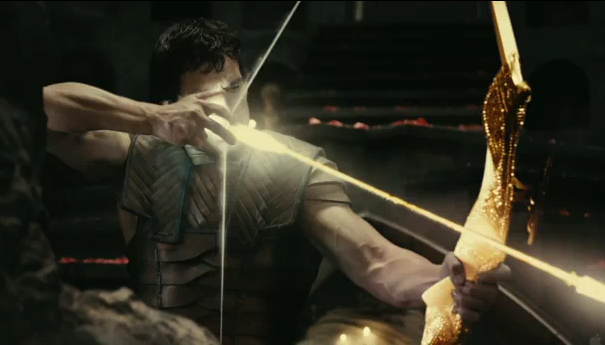 Theseus wields the magically powerful Epirus bow, "a weapon forged by Heracles." Unseen to most humans, angels and demons struggle against each other in the spiritual realm, just as the gods and titans wage war in the film. Meanwhile, mankind is at war with itself, just as humans are forever struggling as a society against our darker sections, against oppression, against poverty, against injustice, against inequality, against lies, against hatred. (And yes, humans also go to literal war against each other all to often, unfortunately not always as a part of this struggle for the greater good). Finally, the one-on-one fight between Theseus and Hyperion can represent the struggle of the individual, to not be swayed by dark temptations, to overcome the fight against evil in their own hearts even as they take part in the ongoing battles around them. It really is a constant struggle, on all sides. The ongoing battle between good and evil in the unseen spiritual realm. Just before Hyperion desecrates a temple, a priest warns, “It’s not too late to end this madness. Salvation can be yours if you wish it.” As you can imagine, Hyperion doesn’t exactly take him up on his offer, but it is a true statement. It is never too late, not even if you are the baddest bad guy. It’s not too late to join the ongoing war against evil, starting with the battle in your own heart. This entry was posted in Action, R, Sci-Fi/Fantasy and tagged christian movie review, faith, fight against evil, movie review, prayer, spiritual warfare, theophany by pagelady. Bookmark the permalink. What a gorgeous analysis. MUCH better than the film. The problems you outline in the **SPOILER-Y SIDETRACK** are certainly part of the reason I felt disappointed. Because really, what’s the narrative purpose of all that? Your point about the oracle’s sisters is powerfully made. To their deaths, they stay loyal. She certainly cannot say the same, and for what reason? Theseus? Selfish, indeed. Reblogged this on Moving Mountains. Excellent! This is so relevant for today.